Frances is what I could only describe as the voice of a perfect hug. Her delicate tones but her fill-the-room powerful voice have sent her straight into everyones Winter playlists. After seeing Frances a few months ago at the Oran Morr, there were about sixty people along with her and her piano. She has the live factor and witty humour of Adele as well as a voice that I swear has never seen a bad day, and the feeling that she wrote every word for you to listen to. Frances is also favoured a lot by Sam Smith who raved about her endlessly, which lets be honest definitely isn't a bad thing. They're both similar in having unbelievable voices and I can see why they are compared closely but she has an edge I can't quite put my finger on. Although she is pretty fresh out of the box, Frances is now signed to Capitol records whilst also being shortlisted for the BBC sound of 2016 beside Jack Garrat and nominated for the 2016 Brit award: Critics Choice. Previously singed to a French label 'Kitsuné' in 2014, Frances has come along pretty well in only three years. My total love for her started with her amazing red hair and her sweet voice with lyrics that you can tell mean so much to her, but mean so much to anyone listening. 'Grow' from her album 'Thing's I Never Said' is my total favourite. Listen to every word and it'll make you feel every emotion possible. 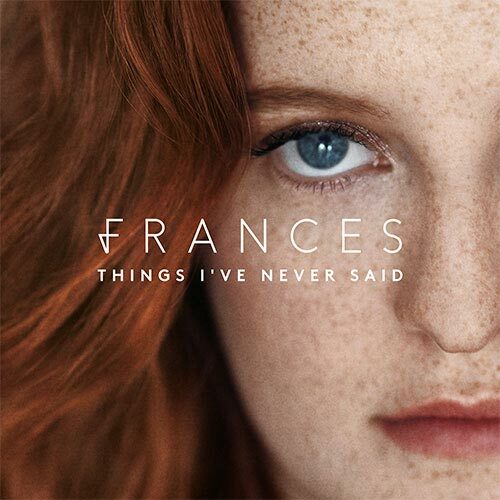 If you're ever looking for that perfect cosy song to have a bath to, walk through the crisp winter winds to or just need to listen to someone singing everything you feel, Frances is your girl.